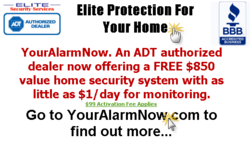 Elite Security Services is all set to continue their dominance in the Phoenix home alarm industry with the introduction of advanced loud burglar alarm to all their home security plans. The efficient domestic surveillance service from the company has made them a familiar name in the United States and Canada. Phoenix home alarm systems from Elite Security Services would now be equipped with highly sophisticated burglar alarm devices. The company has been operating here since last one year and is one of the top service providers in this region. Cost efficient domestic protection plans from them are presently available throughout the United States and Canada. Their security systems are known for providing round the clock security, thanks to some of the latest innovations in the security industry. The new loud alarm device is being offered by the company with all their service plans in Phoenix for no additional price. The latest addition to the Phoenix home alarm plans from Elite Security Services has excellent features to help users build a safe home. Burglar alarms are one of the most basic components of any security system. However, these devices vary a great deal in terms of their functional benefits. A good alarm system must be extremely loud so that the entire neighborhood comes to know about an emergency situation. The device introduced by Elite Security Services conforms to the latest industry standards, and is loud enough to be a valuable inclusion to their packages. Talking about the new burglar alarm device, the owner of the company Paul Shakuri says, "This new device is now available in Phoenix with all our packages. The loudness of the alarm makes it an asset for any home protection system". Elite Security Services presently offers three security plans for their Phoenix customers starting from an affordable monthly rental of $35.99 per month. Apart from offering some of the most economical security plans in this region, the company also plays a significant role in spreading security awareness amongst common men. Talking about the most preferred Phoenix home alarm service provider, John, one of their clients from Phoenix says, "Their packages are amazingly economical and easy to use. The company staffs are knowledgeable and easy to deal with. I could not have asked for more".